Are They Anti-Russia, or Just Anti-Trump? You could count the number of political pundits who declined to prejudge the work being done by the Special Counsel’s office on two hands, but that modest cohort should feel vindicated today. Robert Mueller’s probe has done admirable work by any objective standards. It definitively established that the Russian government was involved in the effort to infiltrate Democratic Party organs and steal their emails, detailed the ways in which the Kremlin sought to influence American political affairs, and charged a variety of malefactors around the president’s campaign with wrongdoing. In the end, however, the probe also established that Trump and his allies did not actively work with a hostile foreign power to steal an election, and there is insufficient evidence to suggest the president sought to impede those proceedings. The Special Counsel’s assertion that Trump did not conspire with the Russians has yielded a predictable reversal. No longer is the probe a “witch hunt” being conducted by “angry Democrats” who are only trying to overturn a legitimate election. Likewise, the “collusion” theory’s most vocal advocates, for whom Robert Mueller was the personification of integrity, appear to be languishing in the denial stage. In a way, this rather unseemly attachment to a preferred narrative is understandable. It will take time to process the collusion theory’s disintegration, particularly because the idea that the president displayed excessive deference to Vladimir Putin in anything other than rhetoric was never particularly well-founded. If Russia and Trump were working together, Russia could not be happy with its return on investment. Even from the earliest days of this administration, Donald Trump never executed the kind of rapprochement with Russia he advertised on the campaign trail. Trump’s White House declined to lift Obama-era sanctions on Russia related to either Moscow’s interference in the 2016 campaign or those that were imposed on the Kremlin following the invasion and annexation of the Crimean Peninsula. Within his first six months in office, in fact, Trump imposed new sanctions on Russian officials and Moscow-linked paramilitary groups. Even as the White House delayed implementing House-passed proscriptions on certain business contacts with Russian entities before complying fully with Congress’s demands, it published public guidance statements which had the effect of prohibiting commercial activity with Russian security and intelligence sectors. It has even imposed Magnitsky Act sanctions on close Putin associates—a step the Obama administration was loath to take. The Trump administration has sold Patriot anti-missile systems and liquid natural gas to Poland, a step Moscow regards with great hostility. The White House provided long-sought offensive weaponry to Ukraine to help Kiev roll back the Russian forces illegally occupying the Donbass region. The Trump administration has presided over the ascension of Montenegro into NATO even as the Russian government engaged in covert operations to prevent that outcome. The U.S. military has even engaged in set-piece land battles with Russian mercenaries and their Syrian counterparts. And when Trump tries to advance Putin’s objectives—like when he sought to withdraw U.S. forces from Syria precipitously—the revolt among members of his party and his administration forces him to all but entirely reverse course. This is not the work of a president who is more beholden to a foreign power than his own country, and that has been evident for some time. That’s not to say that anyone should get credit for clairvoyance. Responsible political observers were obliged to reserve judgment while a particularly fruitful investigation into Trump’s conduct was ongoing, particularly given the number of Russians and Russian-linked entities the probe indicted. But now that the investigation is concluded, those same responsible observers should be willing to acknowledge what was right in front of their faces the whole time. Donald Trump’s repeated dalliances with Vladimir Putin should not have been ignored. He doesn’t get the credit he deserves for a suitably hawkish policy toward Russia because he appears to be constitutionally incapable of saying a bad word about the Russian autocrat. But the executive branch is more than one man, and the Republican Party Trump inherited in 2016 did not have an established intellectual infrastructure or governing class that had any interest in welcoming Russia in from the cold. Given all their anxiety over the last two years, you would think the revelation that Trump is not a fifth columnist for the Kremlin should be cause for celebration. If it were, Democrats would also be celebrating the Trump administration’s aggressive efforts to contain and deter Russian revanchism. But they’re not. 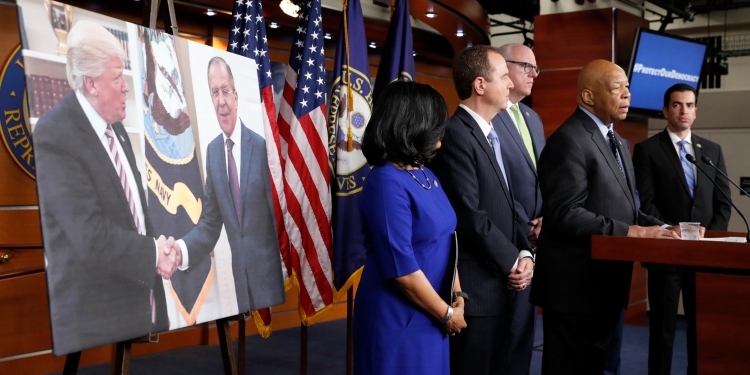 It’s enough to make you wonder: Have Democrats really become anti-Russia, or are they only anti-Trump?